Even as a young girl, Rachelle was helping to plant the family garden. She grew up learning how to live off the land. Fast forward, and as an adult she began to realize just how many children and families were going to bed hungry in her own county, Marion County, Florida. She began to hand out non-perishable food from her bookstore. This didn’t strike her as enough. She wanted to not just give a handout, but a hand up. It was time to make her dreams of teaching people how to grow their own food a reality, and her Feed the Need Garden was born. 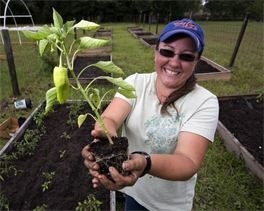 Rachelle works full time on Feed the Need Garden's programs and has acquired a permanent location to teach hands-on classes. She is invited regularly to speak and teach at various groups and organizations throughout the county. For Rachelle this has been a life-long quest. She is excited to share the knowledge that she has about growing your own food, hoping to end hunger locally - one family at a time. She believes that no one should have to go to bed hungry at night, and with the proper training and tools, we all have the opportunity help end hunger. To honor of Rachelle’s passion for gardening, AVEENO has offered one of you a garden-themed giveaway! The winner will receive a special garden starter kit (image above) as well as seeds to plant a select few of the coveted AVEENO Active Naturals ingredients in your own backyard. Even if you aren't into gardening, this will be a stunning gift for one of your friends who is passionate about the beauty of the garden. You really need to check out Rachelle's charity at Feed the Need Garden. It would be nice if you would donate $1 (or more) to completely fund her good work. I did (make sure to "Update Total" at the top of the page. If you continue to fill out the form without clicking that button, you may have to start again). Feed the Need is a 501(c)(3) charity, so your donation, if you make one, will be tax-deductible. To celebrate Rachelle's good deeds and her program, AVEENO wants to help one of you a start at your own garden - or encourage a friend to dig. As a gardener, I drooled when I saw the prize. Do you know how much those tools are worth? While I don't have an exact dollar amount to disclose, anyone who has shopped for gardening tools will know this is an amazing prize. When you grow too many zucchini in your own garden? Donate some to a local food bank or soup kitchen. The needs are great, and we (the United States) aren't doing as much as we should to ensure that no one goes hungry. You can earn a third entry by tweeting this contest. You must include "AVEENO" (without the quotes) and the contest title in your tweet. Remember, tweet the contest title - if you don't, that entry won't count. I will tweet the contest this evening, and you can simply retweet it to earn that second entry - if that's easier. The deadline for entries will be Saturday, August 18, at midnight. The next morning, I will use a random number generator (random.org) to select the winner. I will e-mail the winner on Sunday morning. The winner will have 48 hours to reply to my message and provide a shipping address. After 48 hours, the prize will be forfeited, and another winner will be selected. Make sure to check your e-mail - and look in your spam folder - when the contest ends. This contest is open only to residents of the United States (sorry). AVEENO will send the prize to the winner. For the rest of the legalese related to this contest, please see the Contests/Sweepstakes page at the top of the blog. Good luck! We finally have the space at our new home to garden a bit. After the Arizona summer breaks (115' this week! ), I would love to start planting! What a beautiful mission! Thank you for helping to spread the good word. This looks like a perfect gardener's package-please count me in for the contest. also following you via email..
What a smart Giveaway and what an inspiring story. I follow BTIB on Google Friends Connect. Oh my! My landlord just let me know that I could indeed use the back yard space in our small apartment building for a garden if I wanted and I was thinking of planting everything I love (after some serious tilling, etc.). Thank you for the contest, as always! I've never had much luck growing things in the hot Tucson desert, but maybe I could with this. I would love to have some new gardening tools--mine seem to disappear during the winter or show up looking a bit neglected. I am at sunnlittlane at yahoo dot com. Thanks, Charleston Girl, for sharing this great story, and all the wonderfulness of your blog. I would love to put this to good use! I would love to win this for my mum who's an avid gardener! Please enter me! Wow this is such a great giveaway! It would really help for me to care for the basil and dill I have started! I follow your blog via googlereader! This would be great to have. My other tools have gone missing.